The American Turkish Society and the Institute for the Study of the Ancient World at New York University (ISAW) are pleased to bring you the sixth lecture in their series on the archaeology of Turkey featuring Professor Lorenzo d'Alfonso, Associate Professor of Western Asian Archaeology and History at NYU (ISAW). After a four-year survey in Southern Cappadocia, in 2011 archaeological excavations began at Kınık Hoyuk, in the province of Nigde, Turkey. The topography of the site suggested that this was one of the regional centers of Pre-classical Anatolia. The identification is still open, but surface finds and the first two campaigns of excavation indicate that one of the main settlement phases of Kınık was during the Middle Iron Age. The latest phase of the incredibly well preserved citadel walls date to this period and are the focus of a stabilization project, with the goal of developing the site into an open-area museum. 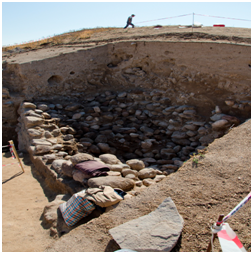 While the latest phases of the site occupation will be presented in association with the main results of the survey, the lecture will focus on the floruit of the Tuwana kingdom and its aftermath, the Late Iron Age, for which the excavations provided interesting and novel results. The event is free and open to the public, however space is limited and pre-registration is required. You may register here. Professor Lorenzo d'Alfonso earned his MA in Ancient Civilizations from the University of Pavia (1997) and his PhD in Ancient Anatolian and Aegean Studies from the University of Florence (2002). Since then he has worked as a post-doctoral fellow and adjunct professor at the Universities of Mainz, Konstanz, and Pavia. His main research interests concern the social, juridical, and political history of Syria and Anatolia under the Hittite Empire and during its aftermath (16th-7th centuries BC).